There is no question that you can be a vegetarian and an athlete. This fact has been supported by a number of organizations, including the Academy of Nutrition and Dietetics, American College of Sports Medicine and the federal government’s 2015 Dietary Guidelines for Americans. The tougher question is: How can I become vegetarian and not compromise my health or athletic performance? Athletes who follow a vegetarian or vegan diet have two concerns. One is that vegetarian and vegan diets are typically low in calories. But athletes have increased calorie needs depending on frequency, duration and intensity of their physical activity. 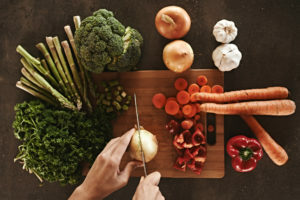 Second, vegetarian and vegan diets tend to restrict essential nutrients that are primarily found in animal sources: Protein, iron, calcium, vitamin D, vitamin B12, zinc and omega-3 fats. These nutrients are crucial to support muscle synthesis and recovery, bone density, and oxygen transport. So it’s important that athletes who eat vegetarian and vegan diets make sure they are getting enough of the right foods. What is a vegetarian or vegan diet? There are two types of vegetarian diets. Lacto-ovo vegetarians exclude meat, poultry, and fish, but eat eggs and dairy products. Lacto-vegetarians exclude meat, poultry, fish, and eggs, but eat dairy products. Both of these diets can provide adequate intake of protein, vitamins, and minerals without major concern for deficiencies if you eat a balanced diet. A vegan diet excludes all animal products, and so presents a special dietary challenge for athletes. Animal products are complete protein sources, meaning they contain all of the essential amino acids our body cannot produce. Amino acids are crucial for muscle repair and rebuilding, bone health and immunity. A vegan diet is limited to plant-based protein sources, of which only a few – soy and quinoa – are complete sources of protein. Vegan athletes also require slightly more protein in their diet since the higher fiber from the plant-based protein intake slightly inhibits protein absorption. Athletes who follow a vegan diet or are considering a vegan diet should pay close attention to what they eat. Make sure to choose nutrient-dense foods that provide adequate fuel from carbohydrate, protein, and fat, plus the necessary vitamins and minerals to support oxygen transport, recovery and immunity. Choose balanced meals and snacks to fuel you before and during exercise, support recovery and do so without any gastrointestinal distress. If you plan to start a vegetarian or vegan diet, beware that the increased amount of fiber you consume may cause some gas, bloating or diarrhea. Introduce fiber slowly and allow plenty of time for meals to digest before you exercise. Proper post-exercise meal/snack choice is vital for all athletes, but especially vegans. After exercise, muscle protein synthesis is enhanced by consuming about 10 grams of a complete protein source. Vegan athletes should consume quinoa or a soy-based food within two hours after a workout. Examples include: 10 oz. soy milk, 1 cup soy yogurt, a soy protein shake, a stir-fry with ½ cup edamame, or 1 cup quinoa. If you’re considering a vegetarian/vegan diet, be sure to take the time to assess what you eat to ensure you are choosing properly balanced meals. If you need help, seek guidance from a sports dietitian.